One of the greatest things about being a vegetarian, a vegetarian who likes food and likes to eat, is the introduction to other cultures and their food. If you are looking to eat less meat and you want to eat things other than pasta and salad, you would do well to start investigating Southeast Asian cooking, Indian cooking, Mediterranean cooking, Middle Eastern cooking… You get the idea. So many of the world’s cooks use meat more as a garnish than as the focus of the plate. Those cultures do wonders with meatless foods. It does take an open mind to start this journey. You will taste different combinations, foods you have never tried before, things will look different. You might need to take a trip to a well-stocked specialty food store, though today’s regular grocery stores stock more and more interesting ingredients. A great place to start might be this soup. There are very few things I don’t like. The list is short. Okra, figs, dates, papaya. I think that’s it. If a food doesn’t have those things (or meat) in it, I will eat it. And actually, I will eat vegetarian gumbo (okra), this salad (fig jam in the dressing), sticky toffee pudding (dates in the cake), and papaya if I don’t know it’s there. So when I see a recipe for something stars things that I like but used in a different way, I’m always happy to give it a try. Unusual is good. Same old same old is boring. Here you make a simple stock and after it has been strained, you add just a bit of rice to give it body. You mix together a bit of cornstarch, Greek yogurt that has been strained, and an egg yolk, temper it with a bit of stock, and add it back into the soup. The whole thing gets a garnish of chickpeas and a pesto made with oregano leaves and their blossoms. Originally I made this soup because I have a lot of oregano growing in my yard and, while I like it, I don’t find I use it all that often. I also made it because it sounded so interesting and unusual and I wanted something delicious alongside my pilaf. It was a huge hit. A hint of sour in the soup, full body from the egg yolk, the heartiness of the rice and chickpeas, and the lemony oregano pesto made this an intoxicating bowl-ful of goodness. As with previous recipes I have made from this book, I had to tweak. I won’t bore you with what I did. Just trust me when I say make this. And make it this way. If you are buying oregano and it doesn’t have blossoms, don’t worry, you just won’t have the pretty garnish. I call for 7 ounces Greek yogurt here because I buy Fage brand and that is the size it comes in. If you have a larger container, use 8 ounces. I used their 2%. Set aside some of the oregano flowers for the garnish. 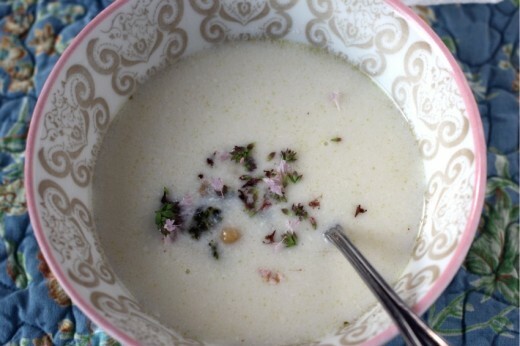 Add the rest of the blossoms, oregano leaves, garlic, pine nuts, and a pinch of salt to a mini food processor. Pulse to a paste. Slowly drizzle in the olive oil and process until somewhat smooth. It will still have texture. If you prefer it smoother, you can add more olive oil. Stir in the Parmesan by hand. This will make more pesto than you need for the soup. Cover and keep the rest in the refrigerator. Heat a large saucepan over medium heat. Drizzle in just enough olive oil to coat the bottom and add the celery, carrot, and onion along with a large pinch of salt. Cook, stirring occasionally, for 5 minutes. Add the thyme, oregano, and bay leaf. Pour in the water or broth. Simmer gently for 15 minutes, then strain into another saucepan and discard the solids. Add the rice to the strained stock and cook for 30 minutes, or until the rice is tender. Spoon the cornstarch into a small bowl, add a little of the soup and mix well. Pour the yogurt into a separate bowl and add about 3 tablespoons of the soup, whisk for a moment, then add the egg yolk and the cornstarch mixture. Stir well. Pour the yogurt mixture into the soup and cook over medium-low heat, just to a simmer and until slightly thickened. Take care not to let it boil, as this will curdle the yogurt. Add the red pepper flakes (if using) and season with salt and pepper. Serve hot in deep bowls. Put a few chickpeas in the middle, top with a spoonful of the oregano pesto, and finish with the fresh oregano blossoms. wow isn’t that a treat. I’ve bookmarked, because this looks like something I must try. I love using Greek yogurt for soup. It has great “mouth feel” and it holds up other flavors so well. Love how unique this is and totally agree about other cultures. Even not being a vegetarian (but a meat-ever that prefers veg food) I love how unique and different ethnic food options are. What brand of pine nuts do you buy and where do you buy them? My husband and I had a horrible experience with “pine mouth” about six months ago. For two weeks after eating them everything tasted wierd and we had a metallic bitter taste in our mouths like our fillings were leaking. I haven’t risked pine nuts since. I usually substitute sunflower or pumpkin seeds or pistachios or walnuts and often with very good result! Lynn, great question about the pine nuts. I thought I would answer here since others might have had a similar problem and I just learned a thing or two about pine nuts. Apparently, many of the nuts we get in the States are coming from China and are a different species of nut that we don’t react well to. It is best to go to a reputable store and ask about their sources. If they are coming from Italy, you will be fine. They will be expensive but worth it – the flavor is totally different and the texture is velvety. They even look different, more torpedo like. You can always substitute with another nut as you have been doing! When I first read the blog title I was not convinced, but I have to say, by the end I was left intrigued. I’ve definitely found myself cooking increasing amounts of ethnic food now that I don’t eat meat…and I’m SO happy about it! I think the only food I really don’t like is celery. Not too thrilled with beets either, but I can deal with them. This soup…no brainer. Love at first spoonful. 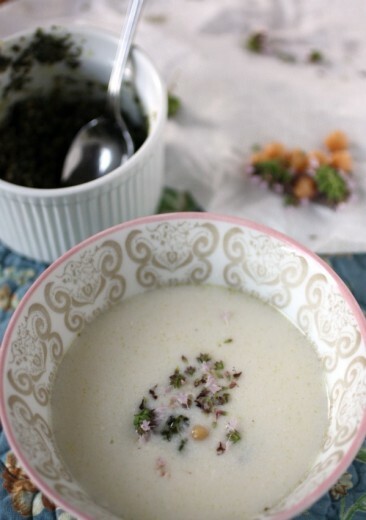 There’s something so wholesomely serene about this soup. I’d love to try it. Dana- I’m so fascinated by these recent recipes, they’re unlike anything I’ve ever seen! Did you know we have a ton of fresh oregano in our garden too? Gosh that stuff grows like weeds. This will be a perfect way to help use some of that up. Have a great weekend!